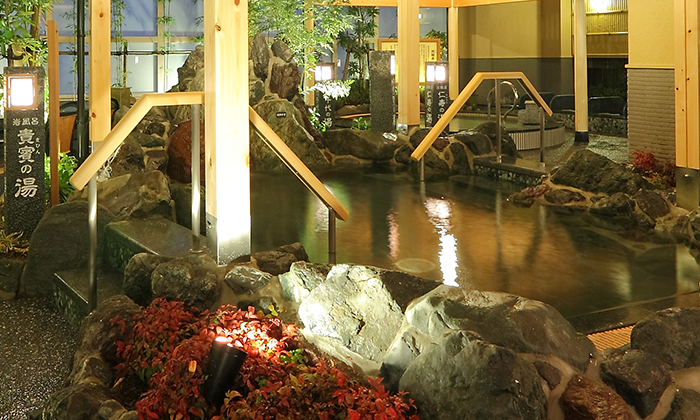 Enjoy the superb twelve onsen variations. Relax, have fun, and enjoy twelve types of baths and a sauna. You can feel effects of nano-mist bathing that will help improve you beauty, health, and longevity. 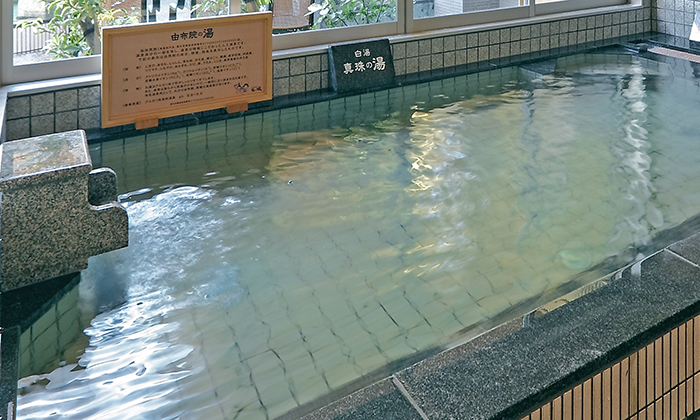 The Yunoshiro is also equipped with outdoor baths, a sauna, and a cold water bath. Appreciate each of the four seasons. It is a time for soothing in a rustic but luxurious atmosphere. 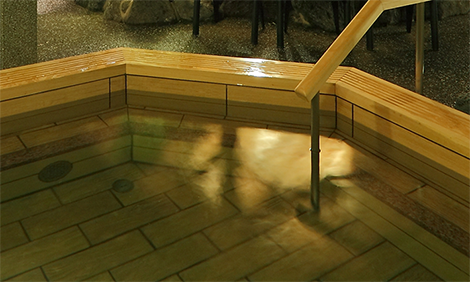 Bathing in a cypress bathtub offers a special touch and aroma of natural treasure. 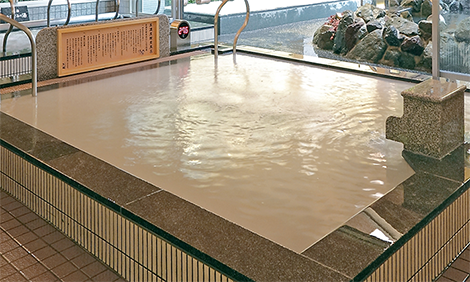 The Japanese traditional cypress bathtub also has deodorizing and antibacterial effects. Named after a women's guest house in the ancient period. It will soothe you with bubbles of highly concentrated oxygen, rejuvenating your beauty and health. The water will leave your skin silky smooth and pearly bright. Beauty effect is expected, too. Put your shoes in a shoe locker and bring the key with you. 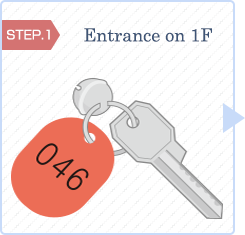 Buy an admission ticket and hand it in to the clerk. Use a coin return locker (100 yen coin). Enjoy twelve kinds of baths as much as you like. Before entering a bath tub, rinse your body with hot water to warm up your body and rinse off sweat and dirt. Keep a towel out of the water. 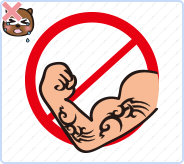 People wearing tattoos, body paint, and seals are prohibited from entering facilities. No hair dyeing is acceptable. Do not put your hair underwater. Refrain from making a big fuss. Do not hold a place. 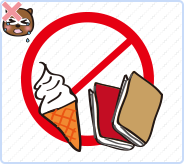 Do not bring in food, drink, books, etc. 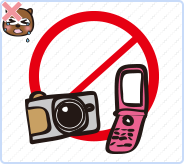 Do not use cameras, cell phones, and other precision instruments. Whole-day of relaxation. Fully heal your body and your mind. 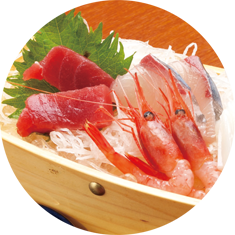 Enjoy all the occasions prepared for you. Sweat, remove waste materials, and refresh yourself. Sweating benefits. After breaking a sweat, you will feel great. Our plasma healing hall is a perfect place to relax and unwind. 1. Buy an admission ticket and a healing ticket. 2. Hand the tickets and a shoe locker key to the clerk. 3. Receive the salon wears. 1. Change into the salon wears. 2. 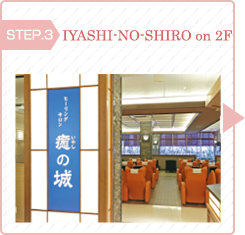 Use the Healing Salon IYASHI-NO-SHIRO on 2F. 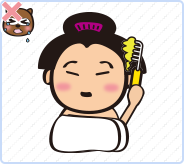 Before exiting the salon, return the salon wears, bathtowel, and bag to the front desk. *For adult use only. Admission fee is needed separately. Enjoy a gourmet dining after bathing. 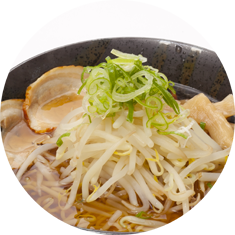 A variety of seasonal dishes can be served! Breakfast and lunch menus are also available. Furthermore, fresh vegetable and fruit juices will vitalize your cells. Have a glass of fresh juice after your bath. 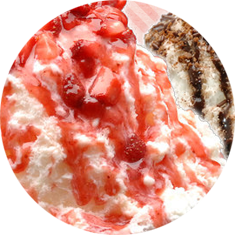 Our recommendation is the Angel Snow, the most popular dessert after dinner. Savor our delicious, specialty fresh juice after the bath. 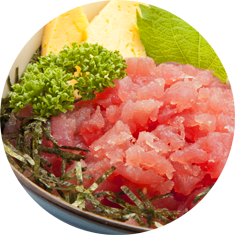 We also offer ice creams, ice shavings, and other various seasonal menus. After bathing, thorough full-body massage offers health benefits. For esthetic effects, Korean traditional skin-scrubbing helps promote your skin respiration, blood circulation, and skin cell turnover rate. Extensive services will welcome your visit. Large-sized lockers are equipped, useful for people travelling with big luggage.Free Wi-Fi access is available in the facility. Feel free to visit us anytime empty-handed. Business Hours Feel easy and relaxed from morning to night. 【From Imaike area】8-min drive from Imaike Intersection. Go north with Tokugawa Art Museum on your left. 【From Nagoya Dome】Go south and turn right at Kodekimachi Intersection. Turn right at Shindeki Intersection. 【From Kasugai area】Go along Route 19 and turn left at Tokugawa 2-chome Interscction. Turn left at Tokugawa Art Museum North Intersection. Shortly on your left. 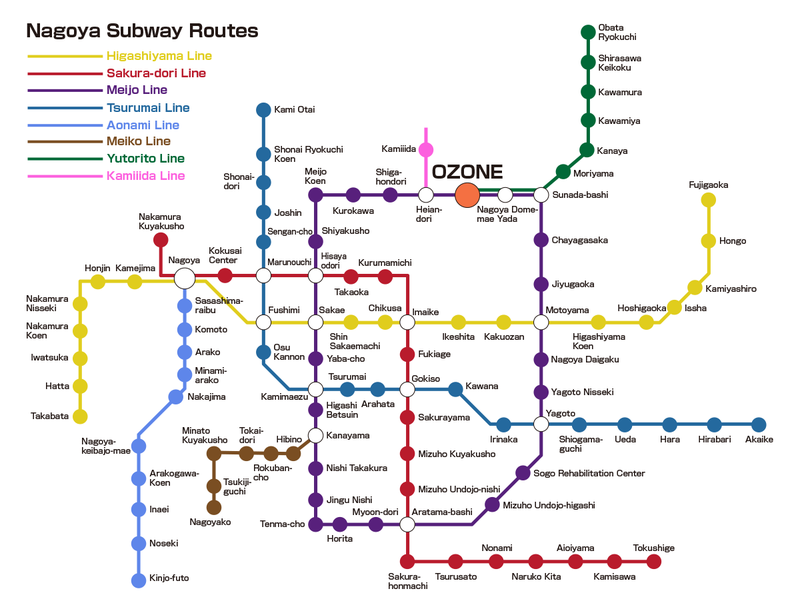 【Subway】Take a Meijo Line subway to Ozone and go out through the East wicket gate. An 8-min walk to south. 【JR】Take a JR Chuo Line to Ozone. A 5-min walk to west from the South exit. COPYRIGHT© YUNOSHIRO ALL RIGHT RESERVED.